Are shots of Resveratrol coming?Prevention of heart disease by increasing levels of "good" cholesterol and protecting against artery damage could be on rise. . Considered by many as one of the greatest wines of the United States, it is rare (...to say the least!) 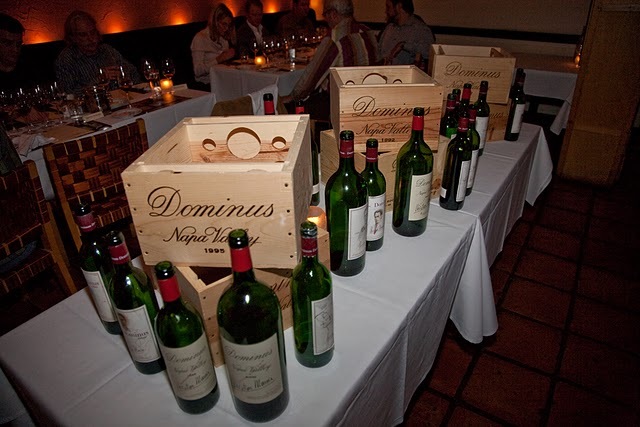 that a 20 year vertical tasting of Dominus Estate would actually materialize. I only know of two others, one at the defunct Spago in Palo Alto (2006) and the other at One Sixty Blue in Chicago (2007). This wine dinner was the culmination of several years of “what if” conversations between Brian Owens (Gracious Wine Collector) and Mark Paul (Co-owner Wink & Zoot Restaurants, along with Stewart Scruggs). Both of these men have been incredibly giving in time, passion, and donations over the years, making the Austin community profoundly stronger because of it. This dinner was Sold Out and was an auction item, with proceeds benefitting the Texas Wine and Food Foundation. I love the “tell of a tale”. Storytelling is important to me. If you’ve been around me, you know that I just about always “have a story”. The folk concept of sharing stories is beautiful. It’s how we relate to each other. From Grandpa passing along a story of poverty, survival, and responsibility, to the wisdom of a 3-year old’s “take” on life. A story is what we have in common. It’s what puts the experience in stride. All too often, in this fast-paced world, the stories get shoved to the sidelines in favor of strict scores, punch lines, or blatant trumpeters. I love to hear peoples’ stories. They are a part of what makes this whole thing real, to me. My wife, Aimee, was my first love in high school. As life’s journey would have it, that initial connection didn’t work out, as the two of us were destined to make a few other stops before settling down together, later in life, as we know it now. At one of my previous business “launch” celebrations, a guest (An Tran, the Valedictorian of our high school) mentioned that he had seen Aimee on Classmates.com. I had never heard of Classmates.com. Late that night, after the last guest departed the gathering, I sat down at the computer, paid the $30 to join Classmates.com, and registered to send her an email. Once again, Gary turns me to another California gem. The 2000 Dutch Henry Cab Sauv Reserve. Born in 1992, this small family-owned and operated winery, located on the original Silverado Trail in Calistoga, specializes in artisinal Bordeaux reds. It’s a wine like this that leads me to rethink my California Value philosophy (my general view being the ‘lack of’). This wine is why I love wine and arrives two-sided. On one, it is a great wine. On the other, it is California Cab. It makes me smile. I plan to explore Dutch Henry. The soulful and passionate California winetreats are out there, so keep the journey alive.